Exercise of the Week: February 29th | Are You Being Real? Look in mirror for 5 minutes and I say I love you repeatedly. This is the exercise of the week from colorful bestselling author, SARK, and this week’s guest on The One & Only Podcast. It’s an opportunity to really look at yourself, see how others see you, and to see what lives below the mask you wear. After personally practicing this exercise, here is my overview of the experience. Join me by giving it a try and chiming in below in the comments section. 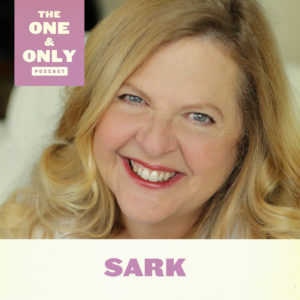 For more from SARK, tune-in to The One & Only Podcast for epic stories (like the time SARK abandoned the money system for 10 years), and valuable tips on how to embrace/work through challenging feelings, manage the voice in your head, and live a compromise-free life.